During this two-day symposium, audiences will have the opportunity to engage with a panel of prominent peace builders and activists from Israel and Palestine, at three public events. follow the links for each event to secure yours today. Are dialogue programs all talk, no action? What impact can people-to-people programs really have? Can joint projects inspire political action? Do joint projects normalize a situation that is anything but normal? Do cross-border projects benefit one side more than the other? What will peace actually look like? Interested in the Israeli-Palestinian conflict? Wondering how talk can be translated into concrete action? 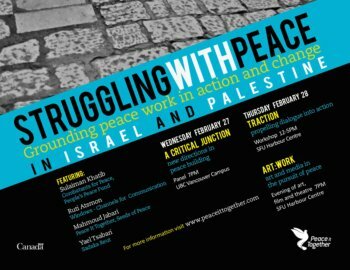 Join us for an engaging forum led by renowned peace builders from Israel and Palestine. In this intimate, hands-on space, we will explore topics related to dialogue and peace building. ART:WORK invites audiences to reimagine intractable conflict through film, live theatre and creative reflection. In this interactive space, presenters will share their craft as artists, media makers and facilitators that utilize art as a tool for change in Palestine and Israel. Visit our website for more information about our guest speakers and confirmed venues, as it becomes available. We are happy to field any and all questions about this event and the topics we will be exploring, in advance of the symposium. We can be reached at info@peaceittogether.com.